If there’s one thing the Pacific Northwest is well known for, it’s mushrooms. I guess that’s because we’re all a bunch of fun guys up here in the upper left corner of the country! Or maybe it has something to do with our soggy climate and plentiful forests. Either way, wild mushroom harvesting is a popular pastime, and this is reflected on the menus of many restaurants around the region. 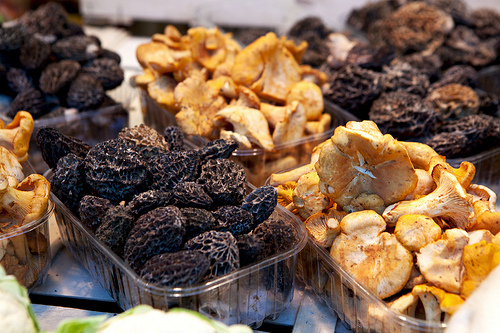 Depending on the time of year, you’re apt to see morels, matsutakes, shiitakes, oysters, lobsters, and chanterelles. I love mushrooms, and often gravitate towards dishes featuring seasonal varieties. Want to pick your own mushrooms? Take a class, buy a guidebook, or tag along with somebody who is experienced. Some mushrooms are poisonous and fatal to ingest, so unless you are sure you know what you’re doing, don’t risk it. If you invest in a guidebook, don’t rely on photos alone; make sure you study the characteristics as well, since some deadly mushrooms closely resemble harmless varieties. Never eat a mushroom you can’t positively identify. Many mushroom hunters are notoriously private about their favorite gathering spots, so don’t be surprised if your friend asks to blindfold you before heading out. (Note: make sure this is a trusted friend. If handcuffs also enter the picture, be leery). If you do gather mushrooms yourself, make sure to pay any fees required first. You may need a mushroom gathering permit and will have to pay a state parks fee if collecting there. Morels (L) and Chanterelles (R): two of the most popular (and delicious) wild mushrooms of the PNW. (Image courtesy of thewanderingeater.com). As much as I enjoy hiking, I don’t trust my mushroom identification skills, so I rely on the experts. There are vendors at both the Vancouver and Portland farmer’s markets that sell wild mushrooms season-round. I particularly enjoy morels and chanterelles. The former is a spring mushroom with a distinctive honeycomb surface and a mild, pleasant taste; just be sure to cook them first, because they contain small amounts of hydrazine toxins when eaten raw. You should also avoid consuming alcohol when eating morels, because the combination can actually increase your intoxication level. Simple preparation is best: I enjoy these sauteed in a pan with a little butter, and sprinkled with salt and pepper. The latter, particularly the golden chanterelle, is a highly prized culinary delicacy worldwide, ranking up there with truffles and the aforementioned morels. These fruity, earthy gems grow in the fall and winter months here in the Pacific Northwest and are suitable for cooking in a wide variety of dishes. They are fat-soluble, so they are excellent sauteed in butter, oil, or cream. Their (relatively) low moisture content makes them perfect for cooking with wine or other alcohol, and they are a popular addition to sauces and soups. Over the Thanksgiving holiday, I made a sourdough, wild mushroom, and bacon stuffing using chanterelles scored from the PSU farmer’s market. They were so fresh, I spent ten minutes picking pine needles out of their fleshy folds – evidence of their wild origins. The stuffing was a big hit, by the way. There are many great restaurants in the Portland/Vancouver area serving mushrooms. One of the best, and a personal favorite, is Navarre (10 NE 28TH Street in Portland, 503-232-3555). They specialize in small plates that are Italian, French, and Spanish in origin, and virtually all of their food is sourced locally, making them the ultimate farm-to-table restaurant in the PDX area. Every dish at Navarre is a carefully considered labor of love bursting with flavors. One of the simplest – and most irresistible – is a plate of sauteed mushrooms seasoned with salt, pepper, and rosemary. These are great paired with virtually any of their meat dishes, but frankly, I could make a meal of these alone.